Sintered NdFeB Magnets - Magtech Magnetic Products Corp. The NdFeB magnets, the most advanced permanent magnet, are made from Neodymium Iron Boron by sintered processing. This magnet has the highest energy products, so it is widely used in miniature products and automatical components. Normally, NdFeB magnets are to be coated with Nickle, Zinc, Epoxy etc. or just anti-rusty treatment to protect its appearance for corrosion resistance. 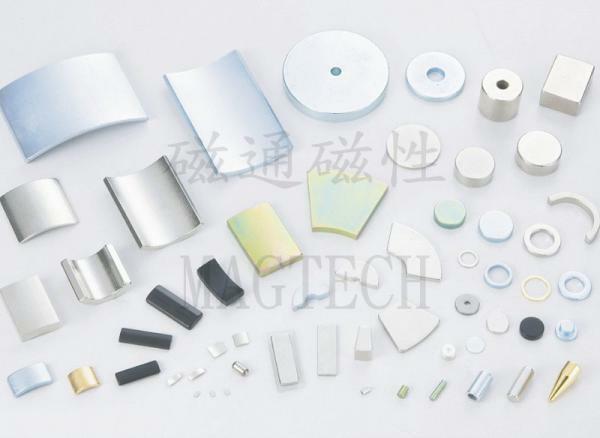 For the time being, the NdFeB magnets are most popular one in magnetic materials, we forecast that this advanced material may last 15 years in the days to come continuously.